Environmental and conservation groups are not giving up in the wake of a decision by the Department of Fisheries and Oceans to go ahead with a roe herring fishery in the Salish Sea in March. The groups had called for a moratorium on the fishery, saying it is not sustainable. However, they said the DFO has announced it would go ahead with the fishery as planned. That is despite a growing petition with tens of thousands of people against it. The fact that the DFO didn’t budge, isn’t sitting well with Pacific Wild. "It is unexpected, given the amount of people who have voiced their concerns wanting to keep the herring in the water this coming herring season. We know that countless people have written submissions to the Department of Fisheries and Oceans," said Ian McAllister, Executive Director of Pacific Wild. He said it is the last herring fishery left on the west coast, and is crucial to the survival of the endangered southern resident killer whales. That’s because the whales’ primary food source is Chinook salmon, and the Chinook’s primary food source is the herring. McAllister said he can’t understand why the DFO didn’t listen to their concerns. "It’s really inconceivable how they don't make the connection between the principle food supply of these endangered animals and that they would allow over 20 thousand tons of fish to be removed from the Salish Sea next month,"
Conservancy Hornby Island launched the petition calling for the fishery to be shut down. It now has more than 46 thousand signatures, and counting. "This government just doesn't care and doesn't listen. Are we simply too far away from Ottawa? We actually thought that the Liberals might want an environmental win out here and this seemed like an easy one," said Grant Scott with Conservancy Hornby Island. "We were very disappointed that DFO and Minister Wilkinson ignored the fact that their management methods have resulted in the closure of 4 of the 5 herring spawning areas on the coast," he added. The DFO said the herring stock in the Georgia Strait fishery are near historic highs. A representative said the decision whether to open a fishery is based on a lengthy process involving scientific surveys, reviews and input from stakeholders such as environmentalists, First Nations and commercial fishers. McAllister said they don’t feel they’ve been heard, so they’re going to get louder and will try to bring international attention to the herring, in hopes global pressure makes a difference. "They haven't listened to Canadians, they haven't listened to local communities, they're not listening to scientists, we can only hope that public pressure internationally might sway them to do what's right and put a moratorium on this fishery." 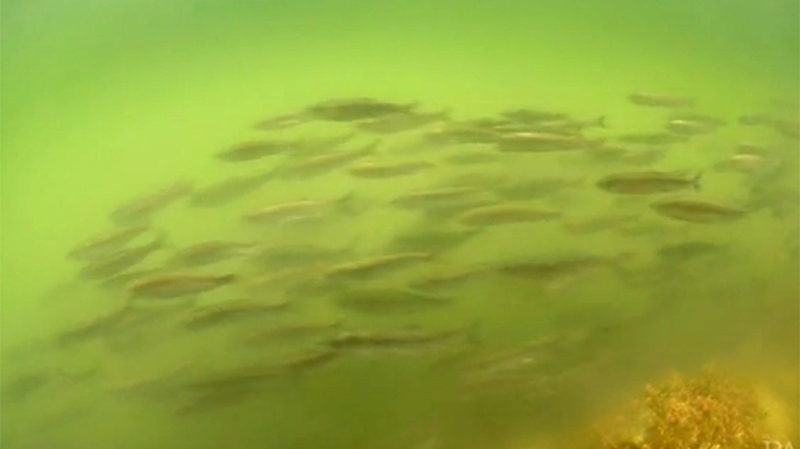 A school of herring swims in this undated still taken from Pacific Wild footage.